It will be, quite possibly, the best $3 that you spend this year. If you grew up in and attended elementary school in Rhode Island, it&apos;s likely that you made a field trip as a tyke to the Museum of Natural History and Planetarium at Roger Williams Park. Well, it might be time for a trip back. 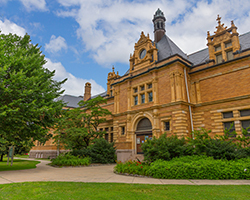 This elegant, yellow brick museum has stood since 1896 in a quiet corner of the park, welcoming school groups and curious visitors for generations. At that young age, the planetarium in particular was an exciting experience. You may remember resting your head in your chair there, waiting for the lights to go out to take you to another place ... almost literally. While it may seem quaint to us now, the planetarium here is actually presenting some of the most cutting-edge research about our universe. The "Cosmic Collisions" show explores these outer-space traffic accidents, which are hypersonic impacts that result in the continuing evolution of the universe. The show is produced by American Museum of Natural History astrophysicists and scientists at NASA. "Journey to the Stars" enthralls with extraordinary images from telescopes on the ground and in space, as well as never-before-seen visualizations of physics-based simulations. What the heck does that mean? Well, let&apos;s just say you&apos;ll never look at the heavens in the same way again. The newest exhibit, "Comet Tales," was prepared by the Northeast Planetary Data Center at Brown University and the museum with the support of the NASA RI Space Grant Consortium. This exhibit coincides with the arrival of the comet ISON, and explores the historical and scientific importance of comets. Mysterious, dazzling, fun and yes, educational, the Museum of Natural History and Planetarium will bring out the kid in you all over again. Call 401-785-9457 or visit providenceri.com for details.